His method was to buy an automobile, obtain title papers for it, steal an automobile of similar description, change its motor numbers to correspond with those on the purchased car, obtain duplicate title papers, and then sell the stolen car to some dealer. In each instance, Barrett sold the stolen vehicles with papers purporting to show that the sales were legitimate. Special Agents Klein and McGovern learned that Barrett was in Hamilton, Ohio after a recent car deal there with the Central Motor Company, but neither they nor the local police were able to question him before he left the area. Acting on a tip, the G-Men – a term used to describe government men, particularly the federal agents working under J. Edgar Hoover – suspected Barrett might travel to College Corner at the Ohio-Indiana border, where Barrett’s brother lived. They drove there on August 16, 1935 and spotted Barrett near the residence of his brother’s home, along with a vehicle matching the motor number of an automobile involved in one of Barrett’s recent schemes. Klein telephoned the sheriff’s office in Hamilton for assistance in arresting Barrett, and he and McGovern parked their car and waited. Before Sheriff John Schumacher and Deputy Charles Walke arrived, Barrett returned to his car with a package in which he had hidden a gun. Special Agent Donald C. McGovern. Courtesy William Plunkett, The G-Man and the Diamond King, page 37. Barrett went to unlock his car door, but as Klein and McGovern started their vehicle and began to approach, he abruptly turned and started walking away. Fearful that he was trying to flee and would elude them again, Klein jumped out of the FBI vehicle and called out to him to stop. Barrett ignored the calls and continued walking down a nearby alley with Klein in pursuit. Once back in the open, the “Diamond King” opened fire, striking Klein numerous times. 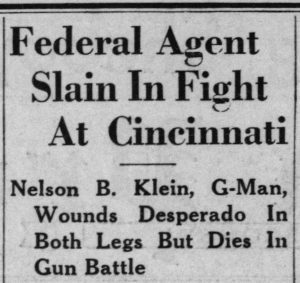 Klein returned fire and succeeded in hitting Barrett in the legs, but the federal agent succumbed to his gunshot wounds and died at the scene. [Zanesville, Ohio] Times Recorder, August 17, 1935, page 1. Courtesy Newspapers.com. Sheboygan [Wisconsin] Press, August 17, 1935, page 2. Courtesy Newspapers.com. The Richmond Item, August 31, 1935, page 1. Courtesy Newspapers.com. Federal officers transferred Barrett from the Hamilton, Ohio hospital to the City Hospital in Indianapolis on August 21. On August 26, the [Hamilton] Journal News reported on the recovery of one of the automobiles Barrett reportedly stole and transported over state lines from San Diego to Hamilton. Barrett allegedly changed the motor and serial numbers of the car before selling it to a garage in Hamilton. Jurors wasted no time in indicting Barrett for the murder of Special Agent Klein and for violating the National Motor Vehicle Theft Act. George W. Barrett. Courtesy Find a Grave. Passed in 1919, the National Motor Vehicle Theft Act – also known as the Dyer Act – helped supplement individual states’ efforts to combat automobile theft in the country. In the fall of 1919, newspapers reported that the practice of stealing automobiles was on the rise throughout the U.S., especially in some midwestern cities such as Detroit, Chicago, and St. Louis. 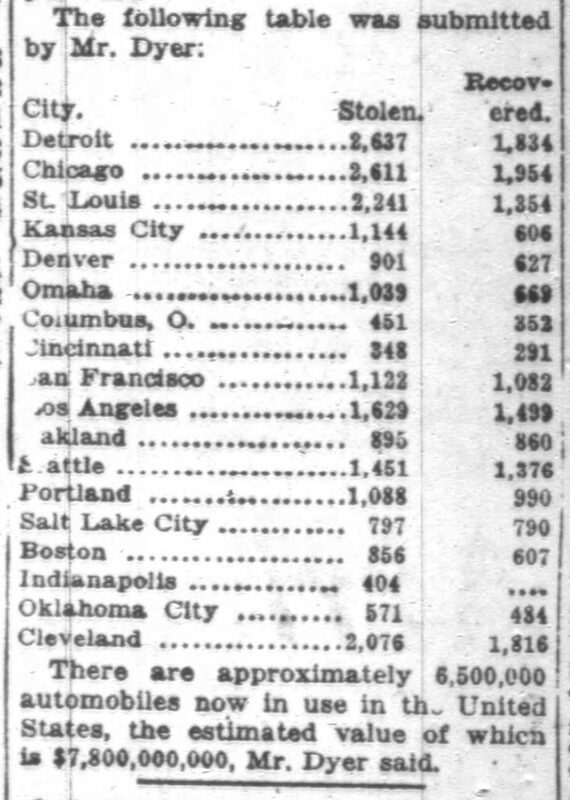 The Indianapolis News claimed that over 22,000 automobiles were stolen in eighteen western and midwestern cities in 1918. Other articles put the number closer to 30,000. 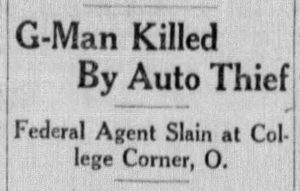 Congressman Leonidas C. Dyer of Missouri, who introduced the legislation, argued that the losses amounted to hundreds of thousands of dollars each year, while also causing hefty increases in automobile theft insurance. Stolen vehicles reported by Representative Dyer. Chicago Tribune, September 21, 1919, section 2, page 13. Courtesy Newspapers.com. The BOI (later the FBI) gained more influence in 1919 with the passage of the Dyer Act . . . now it could prosecute criminals who’d previously evaded the Bureau by driving across a state line. More than any other law, the Dyer Act sealed the FBI’s reputation as a national investigative crime-fighting organization. It was then that Dillinger made the mistake that would cost him his life. He stole the sheriff’s car and drove across the Indiana-Illinois line, heading for Chicago. By doing that, he violated the National Motor Vehicle Theft Act, which made it a federal offense to transport a stolen motor vehicle across a state line. 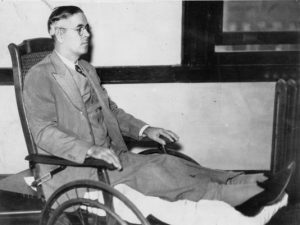 After Dillinger violated the National Motor Vehicle Theft Act, the FBI became actively involved in his capture. Indianapolis Star, December 4, 1935, page 3. Courtesy Newspapers.com. Both the National Motor Vehicle Theft Act and a recently passed 1934 law making the killing or assault of a United States officer a federal offense punishable by death sealed George Barrett’s fate. His trial began on December 2. According to The Tennessean, he was only the second man to be tried under the new law providing for capital punishment in the killing of a federal officer. 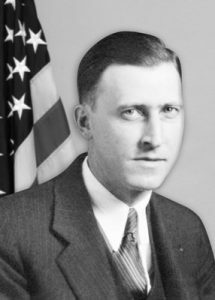 Edward Rice, defense counsel for Barrett, argued that Barrett had been warned days before Special Agent Klein’s killing that Kentucky outlaws were after him and might pose as officers. As such, Barrett maintained that he acted in self-defense out of fear for his life. 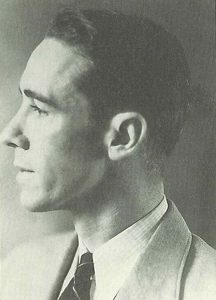 However, during his time on the witness stand, Special Agent Donald McGovern testified that Klein called out to Barrett and clearly identified himself and McGovern as federal officers. 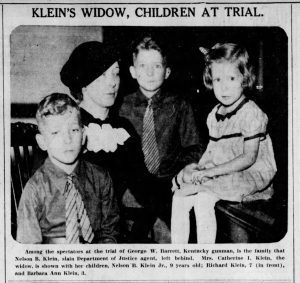 On December 8, the Indianapolis Star reported that the jury only took fifty minutes to return with a guilty verdict. With no qualification calling for life imprisonment, Barrett was to be hanged. District Attorney Val Nolan stated “I think this is the greatest victory for law and order ever achieved in the state of Indiana.” Electrocution replaced hanging in Indiana several years earlier, but because Barrett’s sentence would be carried out under federal law, U.S. criminal code specified death by hanging. Indianapolis Star, December 8, 1935, page 1. Courtesy Newspapers.com. 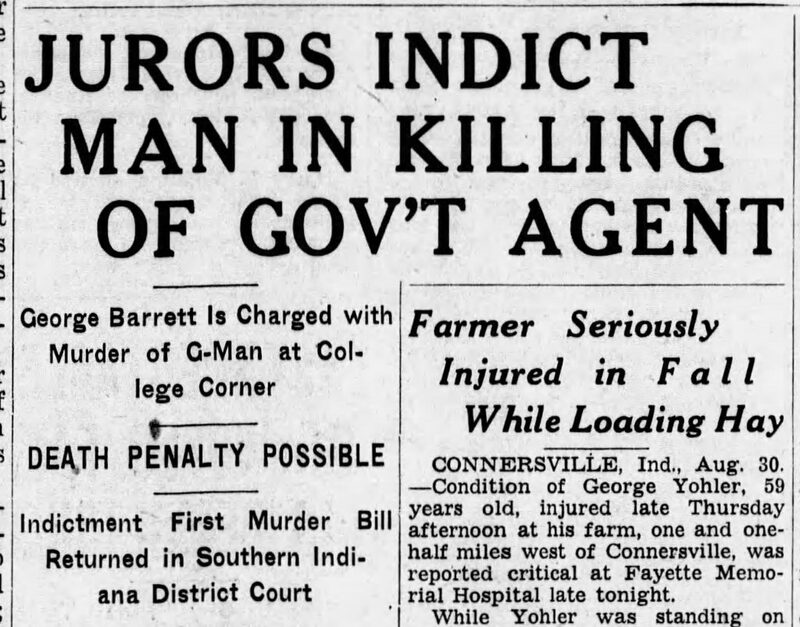 On March 18, the Indianapolis News noted that George “Phil” Hanna, an expert hangman, would lead the execution. Known as the “Humane Hangman,” Hanna had participated in close to seventy previous hangings in an interest to see them done correctly, without additional pain or suffering to the condemned. Barrett hanged at 12:02 am on March 24, 1936 in the Marion County jail yard, and was pronounced dead ten minutes later. Despite the late hour, fifty people reportedly traveled to the jail yard to witness the hanging. 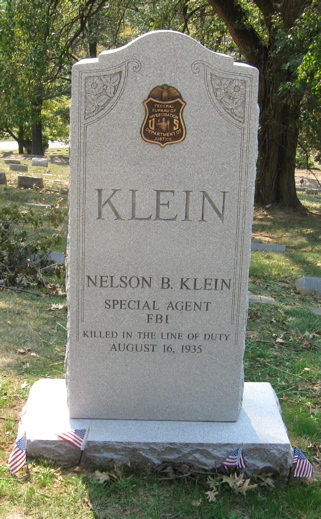 Nelson B. Klein gravestone. Courtesy Find a Grave.